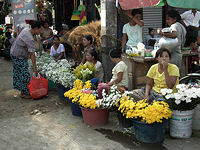 The first time we visited Myanmar was in 2005 when tourism from the outside world was not so popular. Since 2011, and after the release of Aung San Suu Kyi from house arrest, Myanmar has become a top destination for tourism. Everybody wants to see Burma. We decided it was time to re-visit Myanmar to update our knowledge, our tours & hotels. We arrived in Yangon on Monday 23rd April & remembered the airport as it was seven years ago. Joining a long queue of visitors for immigration we spotted a local man waving & smiling at us behind the glass window alongside the arrival area. Because of the lighting & reflection we were unable to recognise this man, or whether he was waving at us or another passenger. It was when we met him outside that we realised that he was the tour guide, Kyaw, who was with us in Mandalay in 2005. He is now based in Yangon. It was so nice to see him again after seven years. It was like meeting an old friend again. On the way to our hotel I noticed the landscape of the city had not changed much. The heat & the late afternoon sun was still warm & welcoming. The sounds of the traffic remind us that we have arrived back to Yangon. We checked in at the Savoy hotel. The Savoy still possesses the same elegance & grandeur of yesteryear that I remembered. The hotel is not very big but has a feeling of staying in an English country house. The rooms are stylish with modern facilities. The courtyard swimming pool is relaxing. The lovely restaurant upstairs looks out to the front lawn & street traffic beyond the hotel gate in the outside world. 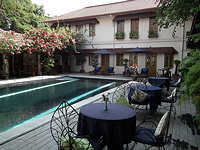 We have been using Savoy in our Deluxe hotels category in Yangon for many years now & we are happy to carry on using it. Next morning before our flight to Sittwe we inspected two hotels, Traders & Summit Parkview, that we use for our Superior & Standard hotels category. Traders has been renovated in recent years. 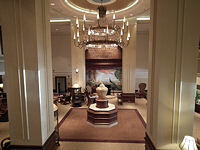 The lobby is now brighter with lovely décor & furnitures. On the second floor the bar lounge has the feel & décor of an old English club. Like the Savoy Traders also has an air of bygone years although it is a large modern building. The Summit Parkview is a nice 3* hotel we use for our Standard hotels category and has a lovely swimming pool in the gardens like a beach resort in the middle of the city. The hotel also has a strong traditional local style, compared to international chain hotels, and offers magnificant views of the Shwedagon Paya. The flight from Yangon to Sittwe takes about one hour. Arriving at the small local airport our local guide, Naing Naing, transferred us to one of the two best hotels in town, the Shwe Thazin hotel. 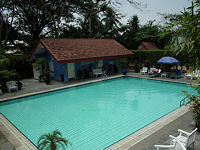 This hotel is only of a guest house standard but it is clean & the rooms are simple but large & comfortable. Once we strolled out along the main street from the hotel we could see the local shops & restaurants are for local people (except one tourist-standard restaurant). Ordinary & daily life carries on with no sign of any souvenir vendors. There is an occasional ‘Hello’ from the children playing along the road side. There are little shops selling tools, electrical goods, toys, household goods & clothing that reminded me of the old shops in our Chinese district of Cholon, Vietnam. My parents also had shop like that in the late 1950's & early 1960's. Our life was simple & innocent just like the people in Sittwe now. Selfishly I hope they will remain this way. Our guide took us to the harbour for a walk along by the fishing village. Here the local fisherman gather around chatting or playing games, local women are either selling goods or cooking their meals in the open air. There are also tradesmen carrying their goods along the road. Children are playing on the low tide muddy beach among the stranded boats. 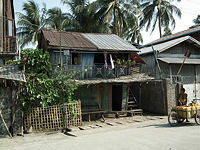 The houses on the other side of the road are mixture of wooden huts & faded colonial houses. We visited a few attractions in Sittwe. First was Maka Kuthala Kyaungdawgyi. This was once a grand one-hundred year old English colonial mansion and is now a dusty & faded museum housing old coins, banknotes & Buddha images. Downstairs is now used by monks teaching children from poor families. The beauty of the once-grand house still can be seen in our imagination. We also visited two temples, Lokamanda Paya & Pa Ya Gyi temple. 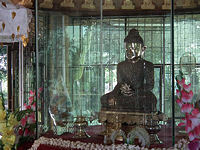 The intriguing bronze Buddha, Sachamuni image, is encrusted entirely by thousands of mini Buddhas dating back to 24BC. By late afternoon we reached the sea beach view point to enjoy the sunset. This is a popular place to come and enjoy a beer whilst watching the sunset. A few plastic tables & chairs are set along the edge of the land with children running out from the shop/restaurants asking you to sit down for a drink. We returned to the hotel. Before nightfall we noticed the trees along the main road as well as those opposite to our hotel were thronging with dangling fruit bats. The noises & movement among the trees were the bats waking and preparing for the night. We were warned that their return in the early morning might wake us up before dawn. Next morning before we headed for the jetty for our boat ride to Mrauk U we visited the morning fish market. This is a wonderful way to see the local way of life. There are wonderful displays of fresh green vegetables & exotic local fruits. The intriguing display of chickens, fresh fish & dry fish & the beautiful flowers being sold in the market are a wonder to many foreign visitors.